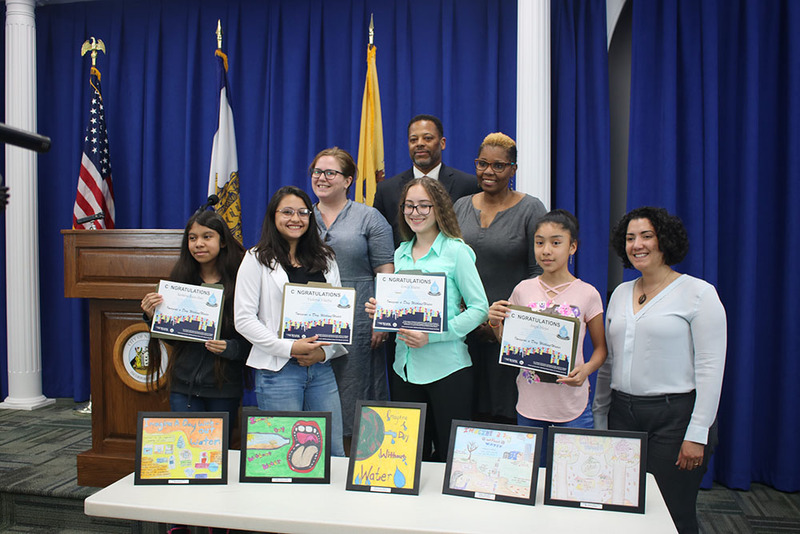 The City of Newark hosted a celebration for the Inaugural “Imagine A Day Without Water” Poster Contest on Thursday, April 27, 2017. Aimed at Newark Public School grades five through eight, the contest engaged city youth to see the value of healthy water and maintaining sustainable drinking and wastewater systems in the future. The department reached out to more than 400 students in 20 schools and received 469 submissions for the contest. The winner was Emily Matos of Hawkins Street School, and the finalists include Angie Moya of Rafael Hernandez Elementary School, Lou Xu of Oliver Street School, Saimira Razo-Paiz of Mt. Vernon School, and Victoria Vilalba of Hawkins Street School. “Creating a sustainable, safe, and healthy water supply of Newark’s future will depend on our actions now. Maintaining that for future generations will be the task of today’s youth, when they become adults. That is why it is critical that we engage them in this process today, so that they become effective leaders and managers on this issue tomorrow, and generations hence will have clean water in which to drink and bathe. I congratulate the Department of Water and Sewer Utilities on developing this program and the talented young artists who brought their creativity to raise awareness of this vital issue,” Mayor Baraka said. The Winner and four finalists’ posters are on display at in Room 117 in City Hall, located at 920 Broad Street. Matos’ poster is also included in this year’s Water Quality Report.